Marvel’s Inhumans is a show unlike any other. And that’s not just garbled marketing speak; soon after its decision to launch the Royal Family via ABC, as opposed to incorporating Black Bolt and Co. into the MCU, Marvel announced a collaboration with IMAX to allow Inhumans to screen its opening two episodes on the large-screen format. It’s a plan that will begin on September 1st, and all throughout production, the likes of Scott Buck (Iron Fist) and key members of his VFX team have been banging the drum for the IMAX platform and how it brings the very best out of the show’s cinema-quality visual effects. That’s something that Serinda Swan (Queen Medusa) echoed in a recent interview with Screen Rant. When asked to describe what it was like to perform in front of IMAX cameras, the actress recalled the tangible sense of excitement that permeated the set. There’s also a handful of new stills for Inhumans for you to feast your eyes on, along with a striking poster that gathers the Marvel royalty ahead of San Diego Comic-Con. I don’t even think I know how large this is. I surely didn’t when I got it. It was one of those things that, you know, obviously with the Marvel world it is very secretive. Everything is held very close. That’s why these interviews sometimes I’m like, ‘I can’t wait to talk to people, but what can I say?’ You know, I want to share everything that we are doing because it is so exciting, because it is so rich and there is so much going on. 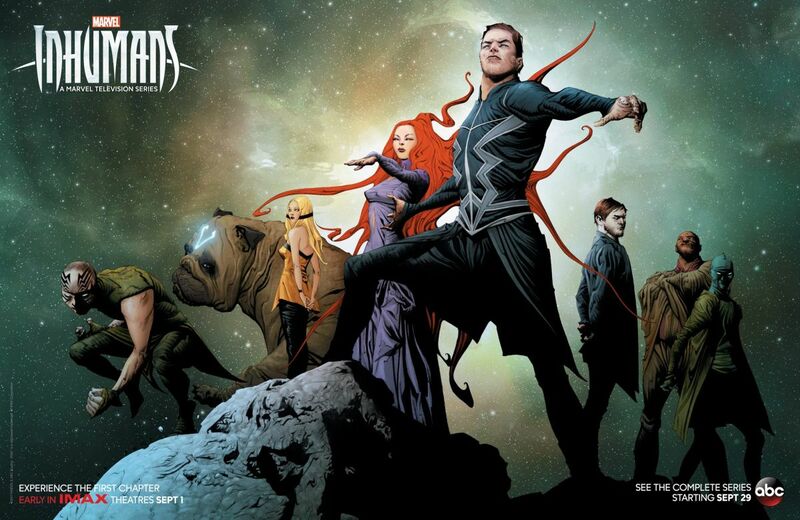 Essentially, it presented Marvel and ABC with a bigger canvas on which to project the intricate, familial story of Inhumans, and Swan went on to discuss how the show’s production values can be compared to a Hollywood blockbuster – from the otherworldly sets of Attilan to the alien costume design. But there is definitely a buzz around set because this is the first time that anything has been done in this capacity, to have IMAX come on board, to have it shown in that way for our first two episodes because, you know, there’s a lot of people who are going to be like, ‘It’s a movie!’ No. It’s a TV show done this way. Because a movie, yeah, there is IMAX movies. There are Marvel IMAX movies, but this is a television show in that scope, which is so exciting to see. But you can definitely feel it on set. From the sets to everybody involved to everybody at this table that is interested, you can definitely tell that it’s going to be a lot of fun. It’s going to be a lot of fun. Following its grand debut across select IMAX theaters, Marvel’s Inhumans will begin its eight-episode stint with a double bill on Friday, September 29th at 8:00 pm ET.